The holidays have arrived. The hope is that this time of year brings you nothing but joy. In an ideal world, your days in December are packed with fulfilling holiday traditions and supportive loved ones. Although this is what most people think (or at least hope for) in regard to the holidays, the reality for many is much different. 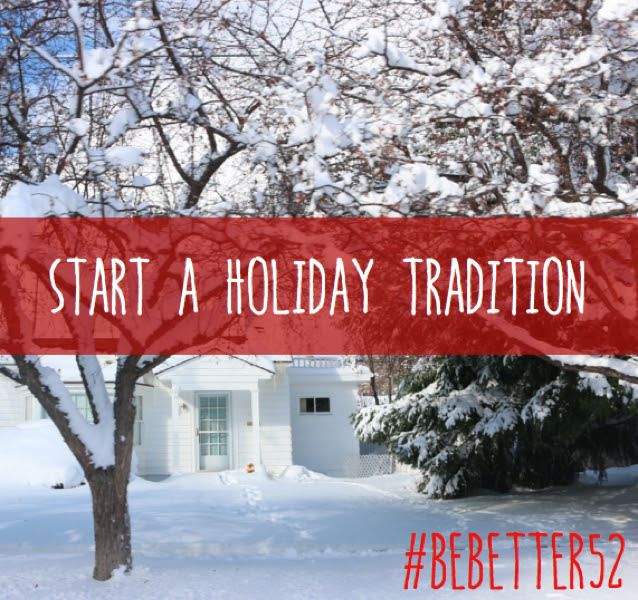 This week’s #bebetter52 challenge is to start a new family tradition. It can be as simple as sipping peppermint hot chocolate while bundling up for a walk outside or watching your favorite holiday movie as a family or with a friend. Why do we want to encourage you to start a new family tradition? We want you to recognize that new is OK. To get through life, we need to be flexible and embrace change. Don’t let the holiday traditions be another thing you “have to” check off your list; make them something meaningful to you. Why do we have traditions? For some, it’s a way to create memories. For others it could be as fundamental as trying to put structure on an unpredictable situation. For many families, traditions are considered sacred, and changing them is a sensitive topic. We love the saying from The Happiness Project, “In the long run, traditions and rituals help to sustain happiness and family bonds.” However, as author Gretchen Rubin writes, not everyone is interested in keeping up traditions. If tradition isn’t important to you, she says, “try to be patient and play your part." If tradition is important to you, try to relax and enjoy the day, whatever happens. Let’s face it: we put a lot of extra pressure on ourselves in the process of creating what we feel like the holidays “should” be instead of reflecting on what we “want” the holidays to be. Work on not setting high expectations, but be present in the moment and allow the unpredictable to happen. Enjoy the unknown and the spirt of the season. Follow some of these guidelines when creating new family traditions this holiday season. Traditions are an opportunity to create memories, not an errand to be checked off a list. Ask yourself, do you really enjoy the ritual? If not, eliminate it. Change is good, so if a tradition isn’t working anymore, don’t force it. Eliminate the unnecessary parties, gifts and activities that do not bring you joy. Spend more quality time doing the things you enjoy during the holidays. Emotions tend to be imbedded into traditions, so understand that changing or starting new ones can be an emotional process. For example, you always baked Christmas cookies with Grandma on Christmas Eve, but Grandma passed away this summer. You will be reminded of this loss when you don’t have Grandma by your side mixing the cookie dough. Be thoughtful about the values and traditions you want to pass on to your children through your holiday activities. Include your kids in all the preparations. It allows you an opportunity to take things off your plate and empower them to learn how to decorate and bake. Make traditions about the nontangible items. For example, volunteer your time, or exchange gifts of service such as emptying the dishwasher or babysitting your siblings. Coping with loneliness during the holidays.